What about mice and other pests living in the straw? Won’t the straw bales catch fire really easily during a bush fire? My wife, Rosalba, and I have started the process of building a new Strawbale home where we are currently in the planning stage. Rosalba runs a successful Acupuncture and Traditional Chinese Medicine clinic in Brisbane and is used to thinking a little differently as part of her business. I, Mark, run Avanti Hosting, a small web hosting company, and feel like I need a little balance in my life from all the new fangled computers, servers, switches, Internet, etc. that form part of my daily life. So Rosalba and I bought some land at the top of the Mary river valley, about two hours drive from Brisbane, for our ‘back to basics’ urges where we decided to build our new home using straw bales. In this article I’d like to address the above questions. Straw bales are a renewable resource and most of the straw in Australia is actually burnt on the field. By using straw bales for the walls of our new home we will actually reduce the amount of green house gases released just by the mere fact that the straw we’ll use has not been burnt. Additionally the straw we’ll use will be preserved for many years which means that the carbon contained in the straw will be trapped for quite some time. Also from what we have read so far the walls of a building make up about 20% of the cost of building a home. Using straw bales you can save quite a bit on the cost of the walls because a) straw bales are cheaper than bricks per square meter, and b) straw bales are easy to stack up to make a wall and lend themselves to be built by the owner. In other words building with straw bales is quite forgiving. Last but not least, the thickness (up to half a meter) of the straw bale walls makes for a very comfortable home and inspires a feeling of security and being at home. The main thing when building with straw is to keep it dry, not much different from building with timber. 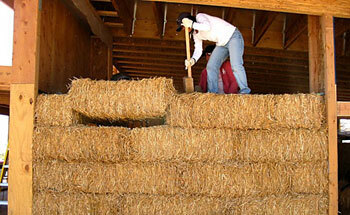 There are a few things you can do quite easily to ensure your straw bales don’t get wet. We intend to build our new home using the infill method, basically have a frame built out of timber or steel that is strong enough to hold up the roof. So we will have the frame erected first and then the roof finished as well. Once the roof is in place, we’ll have the straw bales delivered and will store them under the roof until we use them to build up the roof. This should keep them dry. Once the straw bale walls are stacked to make up the walls, we will render them using most likely a lime or earthen render as opposed to a cement render. The major advantages we see with the lime render are that it automatically fixes any small cracks by itself and that a lime or earthen render will let the straw bales breathe. This breathing ensures no excessive moisture is trapped in the straw bale walls. Once the walls have been rendered there is no way in (or out) for mice and other pests. Any creatures trapped in our straw bale walls will most likely die of thirst. Also it is important to ensure that you build with straw and not hay. Straw is the left over stalks of wheat, rice or other grains after harvest and has vary little nutritional value for any creature. Hay on the other hand is grass that has been cut and slightly dried with the seeds still attached. Hay is generally used as fodder for live stock so it has quite a lot of nutrition contained within it. Another interesting fact is that most termites will not eat straw. See Strawtec FAQ (Termites/Rodents/Insects) and Brian Hodge author of “Building Your Straw Bale Home published by CSIRO publishing”. Won’t straw bale walls catch fire really easily during a bush fire? To sum up, Rosalba and I are building our new home using straw bales because of the environmental benefits, because we can easily get involved with the actual building ourselves, and because of the increased comfort offered by straw bale buildings compared to standard built homes. 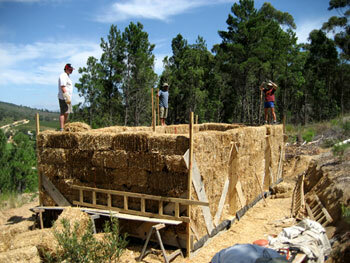 This guide to building Strawbale Houses has been written by my friend Mark Burgunder. What an interesting article. I had never heard of strawbale houses. Very interesting article. Mark, you answered some questions I hadn’t even thought of. I’m following your progress with a great deal of interest. reason given for using straw bale house is true bcoz if we burn all the straw then problem of pollution may arise so use of straw in this manner is quite fantastic for ecofriendly people. interested in hearing more. i want to build one myself but limited by work and not sure i can build it all myself. have been told owner builder can save loads of cash but contracting a builder is comparable to a brick cladding place. so you guys are both living working in brisbane and travelling weekends to build your strawbale house? that gives me hope. perhaps i can co-ordinate weekends and holidays and run it myself. did you do a strawbale house making course? Building any house is a daunting task. In our view choosing to go strawbale actually makes it a little less daunting as stacking the strawbales is easy enough. Not much unlike playing with LEGO which I have done as a kid quite a lot. Anyway, we won’t be doing it all ourselves. We’ll have a builder do the foundation and build the frame and roof for us. We’ll then put the strawbales into the walls and apply a render on both sides. Thank you for the information. I’ve often thought about pursuing such an endeavor, but time is limiting and I’ve had certain concerns regarding the longevity of such structures with regards to straw rot, etc. I’m still curious how one would deal with very humid conditions like what we experience in Georgia. Erecting the roof first helps prevent direct moisture from precipitation, but how does one combat moisture in general (ie 100% humidity)? I am thinking of purchasing a straw bale home in rural Victoria and wonder which insurance company will insure my home. Can anyone advise, thanks. I like your idea. I’m planning to build a strawbale house, and this post really helped me a lot. I built a straw bale conference room for the organization I was running – Imran Khan foundation earlier this year. We were trying to provide cheap housing for flood victims in Pakistan. The only major problem I faced was the roof. How do we build without creating demand on wood in a country which has destroyed its forests already. What is the substitute. Do you know of roofs in bamboo that we can put on load bearing straw bale houses. Wish I could mail you a picture of what we did.